There is something magical about the three-dimensional appearance of Puffy Paint. Puffy paint is easy to make and you can simply find the ingredients already at home. Allow the kids to use the Puff Paint recipes as finger paint as well — although I don’t like adding color to the puffy finger paint because I have had trouble washing off the color from little hands previously. Here’s what to do. 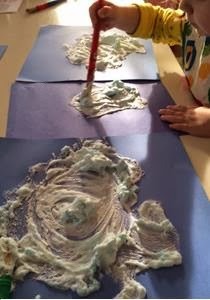 Simply mix equal parts of shaving cream and Elmer’s glue. Add food coloring, a few drops at a time, until you get the desired color. Apply the puffy paint to heavy paper.